When is big better? When you can’t remember where you parked at the mall. That’s when your Escalade, which stands taller than a Texan, allows you to see where you parked it. Big is also better when you need 7 seats to carry the soccer team home from practice. 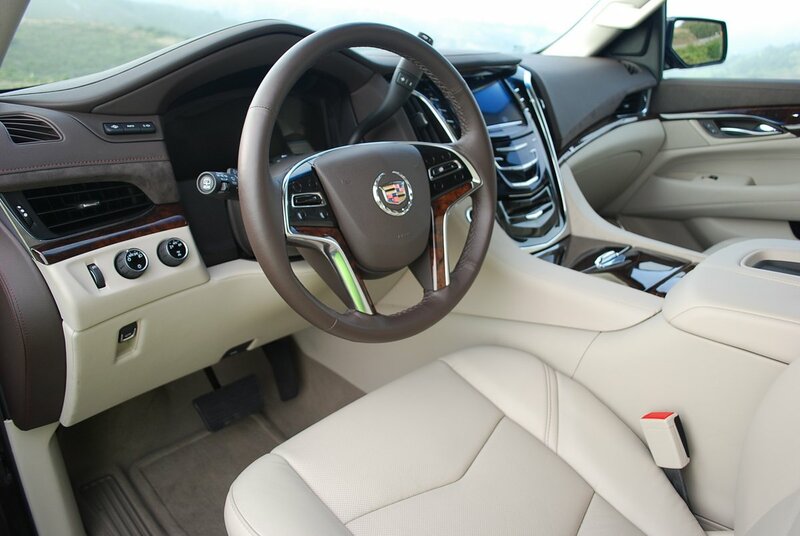 The Escalade will handle that assignment without worry. And big is best when you need to tow a heavy trailer. Cadillac rates our Escalade, equipped with optional ($500) 22 inch “Dual 7-Spoke Ultra-Bright” alloys at 7,000 pounds tow capacity. This 3rd generation Escalade is based on GM’s recently released, all new GMT900 truck. 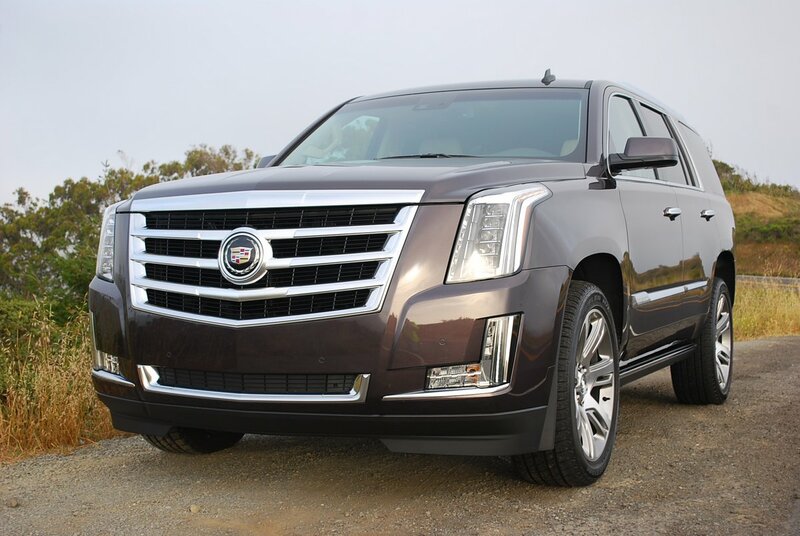 Escalade fans and owners have waited patiently for 7 years for this updated Cadillac SUV. In the Cadillac idiom, big needs to be imposing. The revamped Escalade, with its massive chrome grill, and vertical cascade of LED light pods, stands tall enough to double as a movie theater marquee. Climbing aboard is no mean feat, as the roofline stands 6 feet 2 inches high, and the step-in height from ground to cabin is an imposing 22 inches. Optional ($1,695) Assist Steps. Power Retractable reduce entry height to just 10 inches. But since these wide running boards remain in position when doors are open, they interfere with cabin access when you just want to reach in and grab something. For a vehicle that weighs more than three tons (6,027 pounds) this behemoth is reassuringly quick in a straight line, thanks to its 6.2 liter V-8′s 420hp and 460lb.-ft. of torque. A recent Motor Trend test pegged its 0-60mph time at 6.1 seconds, with a quarter mile run of 14.6 seconds at 95mph. On a twisty stretch of two lane blacktop, this Cadillac proved its versatility by powering through passing opportunities while maintaining equilibrium in turns due to the massive footprint of its 285/45R22 Bridgestone Dueler H/T tires. The Escalade carries a space saver spare tire tucked underneath the back of the vehicle, but according to diagrams in the Owner’s Manual, releasing it for use looks to be no simple matter. 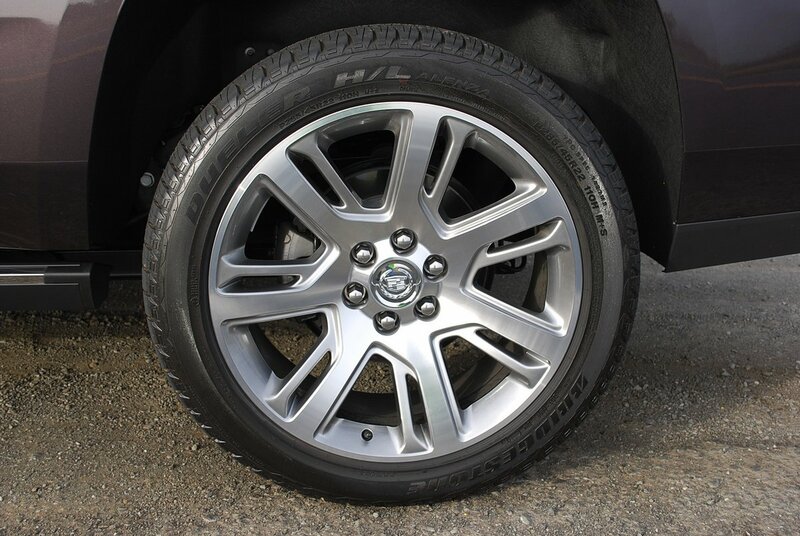 However, Cadillac provides concierge level roadside service that extends to tire changes, as well as fuel replenishment should you run dry. If you call for assistance on any problem and you’re within 30 miles of a Cadillac dealer, you can expect a representative of that dealership to meet you at your car. Otherwise, GM will arrange for a tow. Inside, this latest Caddy confection is palatial. Everywhere your eye comes to rest is either real wood, hand cut leather, or rough-out suede. In a color scheme delectably described as “Shale with Cocoa Accents,” the passenger compartment of our Majestic Plum Metallic SUV will convince you that you’ve just checked into the Ritz. Power aids for every whim and notion abound. All four aft seats flip down with the push of a button. The pedals rise or retract electrically. The steering wheel is heated, as are the four front chairs. Ventilation fans cool the front row seats . If you wag your foot under the liftgate it will open automatically, freeing you from the need to grab a latch or find your key fob. You can even program the liftgate’s opening height. 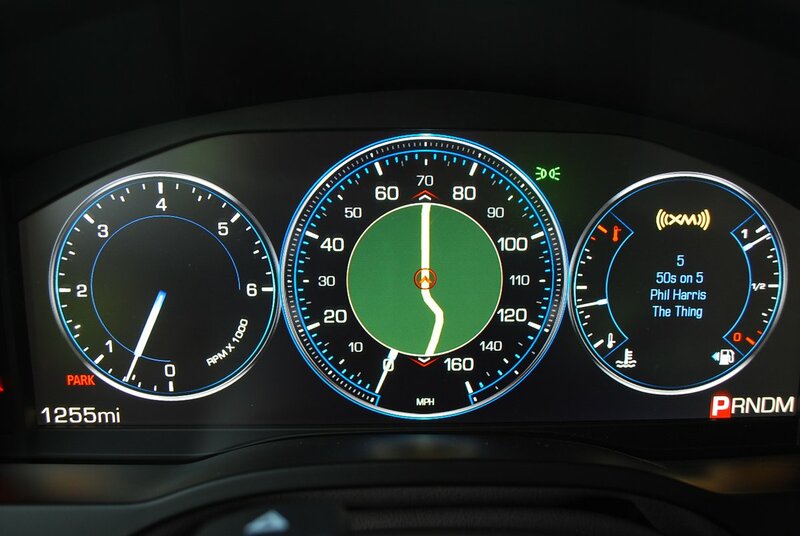 You can configure the 12 inch full color gauge cluster to show four different instrument renderings: Simple, Performance, Balanced and Enhanced. We went with the “English Balanced Cluster” which displayed engine rpm in the left face, speed in the analog center dial, and water temp/fuel level in the right window. A five way control wand to the right of the steering wheel accesses information cluster menus and options. The Escalade’s 130 inch wheelbase and 224.3 inch length insure maximum stretch room for all passengers, plus hangar class storage when you fold the rear chairs flat. Unfortunately, the resultant vast load floor stands 39 inches above pavement height, so you’ll need to heft your goods more than three feet in the air before you can slide them aboard. 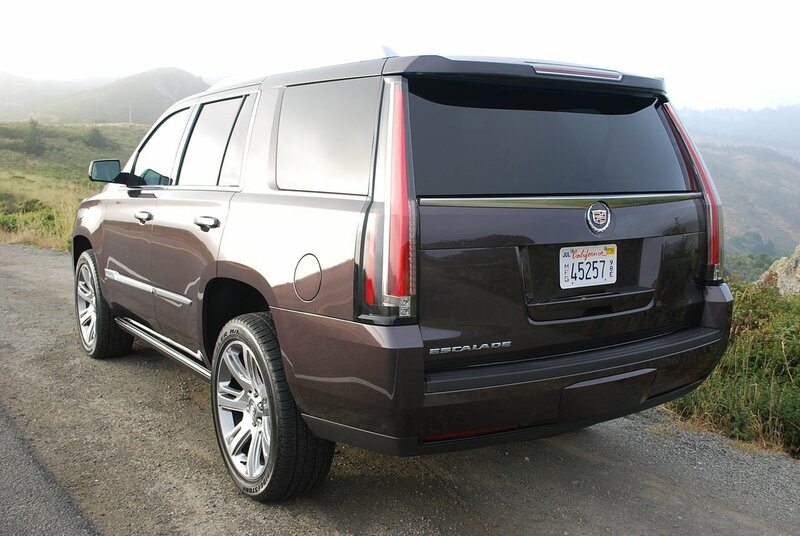 On the other hand, the Escalade’s vaunted stature gives you an unparalleled view of traffic and road conditions. In the event that you fail to use this rare sightline gift, Escalade is fully endowed with safety aids that will keep you out of trouble. Side Blind Zone Alert, Rear Cross Traffic Alert and a Rear Vision Camera are all standard features. These warning harpies integrate seamlessly with normal driving, never becoming intrusive as so many other systems do. From time to time you may hear an alert chirp its presence, or feel a gentle nudge from your seat. All of this is helpful rather than annoying, and a model of civility other manufacturers would do well to emulate. Albeit expensive, the 3rd generation Escalade is once again the aspiration SUV for technocrats seeking the thrill of tomorrow today. 2010 Chevrolet Camaro vs. 2010 Ford Mustang - Which one does retro better?